PREGNANCY WEEK 24 – 37 | Beverly's Net: family. food. fashion. PREGNANCY WEEK 24 – 37 – Beverly's Net: family. food. fashion. I’m a pee monster! I keep having to run to the bathroom every hour or so, and I wake up once (sometimes twice) every night to pee, thanks to little one’s head bonking on my bladder. He also loves to drag his fists across my bladder, which really makes me RUN to the bathroom! I’m back to my 3x/week exercise and feeling really fab about that 🙂 So far, the accuracy of people here guessing “It’s a boy!” is 100% – which is quite astounding considering that’s around 10 people or more that have guessed correctly. He’s still ultra-active, and he can hurt me even more than before now since he’s packed on bone density and body fat. It literally feels like he’s struggling to break out of my belly – furious, purposeful strokes and whacks that make me *gasp*. I noticed bleeding one night, and again in the morning, so doc asked us to go immediately to the hospital when we called. Was hooked up to the machine for awhile and was determined to have “very regular, and very frequent Braxton Hicks contractions”. I don’t feel the contractions at all, though I’ve been having them for the past few weeks almost 24/7 (I can tell when I put my hand on my belly and it’s super hard). 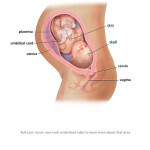 I’m also already 1cm dilated, effacement (thinness of cervix) is 70%. Been asked to cut down on exercise for the next 2 weeks until I’m at “full term”. Arghhhh!!!! During our Doc appointment this week, discovered I am 1.5cm dialated, 80% effaced, -1 station. Everything’s progressing smoothly and my body is behaving itself so far, and doing everything it’s supposed to do. However, it’s still not a guarantee he’ll come out on time. My little treat for myself in my final few weeks is pampering – getting my hair washed at the hairdressers, manicures, pedicures, spa facials and massages. Most of all, hitting the gym again! HALLELUJAH!!!!! After a 2-week hiatus, I was itching. This week, I did 20-30 min yoga sessions, 2x a day, every day. In addition, 30 mins cardio sessions at the gym, 4x a week. I know it seems like a lot for a heavily pregnant full-term woman, but my body insists on it… If I don’t, I get super irritable with all the excess energy in me. I just feel so good after doing exercise, and I know it’s good for me, plus can kickstart labour – so it’s a win-win 😛 I’m just so giant in the past week that I can’t get comfortable sitting on the couch, and the only thing that makes me feel good/normal is exercise… so I crave it constantly, to the point where I actually fantasize about it and dream about it! Weird! its really *any time now*!!!!!!!!! gosh! cant wait to get news of the little one’s arrival! It’s getting exciting but annoying playing the waiting game, heh. Trying to enjoy all our peace and quiet time, but really, we just want him! Thanks for sharing, Beverly. I always love reading your updates on your pregnancy (amongst other things, of course)! Just wondering, what kind of cardio do you do @ the gym whilst you’re full term? Cycling or perhaps brisk walking? I’m wishing you well for your labour! You’re gonna be a great Mama! For most of my pregnancy I did 10mins treadmill (either jogging or fast walking at a high incline), 10 mins cycle, 15 mins elliptical, 10 mins stretching. But now I do 10 mins treadmill (fast walking at a high incline), 20 mins elliptical, 10 mins stretching. It really IS any time now – so exciting!! Can’t wait to hear of your adventures in mommyhood. Am totally, totally in awe of your work-out schedule. So very, very disciplined!! Btw, just to keep you updated (Beijing mom to Shanghai mom) we popped the day after NY’s – almost a month early!! wow does everyone stare at u at the gym??! u’ve inspired me to exercise if i get pregnant again! hope your baby boy will let u post often after birth, im sure you’ll have lots of interesting stories to tell! I guess you are on maternity leave now or you got off work a few weeks ago? Oo yes I am, started the week after Christmas! I always think it’s fascinating when pregnant ladies know what position their child is in, or what activities they’re doing. How do you know he’s standing or lying on his side? Can you see his head or feet imprint maybe? Hands and knees! Hands and knees! Heheh yeah Chris is gonna send out a txt, if he remembers 😛 Praying for within the next 2 wks! good luck! i can’t wait to see your chubby cheeked baby! wow, 1cm dilation can last so long without actual labour? hehe! Hope he engage soon, else you’re going to have a hard time in natural birth! He’s going to be a huge baby at 3.5kg!! You need all your strength, babe!! Oh he engaged/dropped weeks ago! So basically all ready , just waiting for him to come out, lol…. I hope everything goes as smoothly in labour as it seems to have gone in your pregnancy, Bev. Best of luck. omygawd, you’re tiny and he’s 3.5kg… ohmygawd. That being said, the doctor said my kiddo was 4kg but she was 3.46kg at 40wk and 4 days. I had an overdue posterior baby naturally sans epidural and just wanted to tell you, some “physical adjustments” may be done by your gynae during labour as the position tends to make labour more prolonged. My doula did a lot of hip squeezes during labour which helped ease the sacrum aches. Get your husband to place hot water bags or bean bags on your sacrum too to ease the aches. All the best for your natural birth- you can do it! Nope he’s still merrily in there. Counting the days to the 19th now!